The Worldwide Weaving Web brought a new book into my home last year which has inspired my third wall hanging project. If you can’t bear to look at yet another of my red, black and white warps on the loom ready to be woven, you had better look away now because here we go again! There isn’t a whole lot to show for a week of work, is there? What you don’t see is the reading, sampling, un-weaving, re-warping, charting, erasing and Googling. In fact, as I sit in front of this warp, I have the uneasy feeling that I may be jumping the gun and launching into the big project too early. I have actually unwoven the first line of pattern twice and made adjustments. Clearly my sampling didn’t cover all I had in mind. I am using the work of the Wayuu people of Venezuela and Colombia as my inspiration for this project through Dutch author Mirja Wark’s book Si’ira. A lady in one of the Ravelry weaving groups posted about the existence of this book in the middle of last year and I was on a mission to get hold of it. My friend Anna in Australia, who is from The Netherlands, took care of the local payment and then offered the book to me as a birthday gift. Thank you, Anna! It is a beautiful hard cover book full of drawings and photos of the si’ira which are worn by men, their designs, the weavers and the vertical looms that are used to make them. 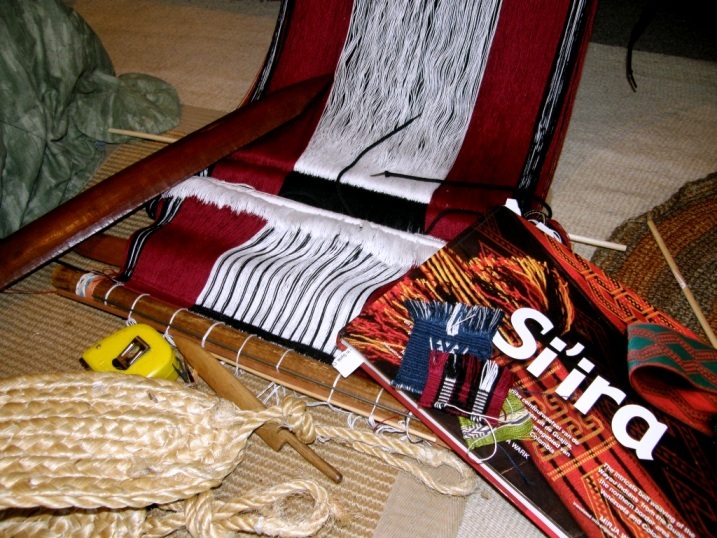 The skills required to make a si’ira include weaving, twining, braiding and tassel making. This image is from Mirja Wark’s web page. The Wayuu live on the Guajira peninsula which is the northernmost border between Colombia and Venezuela. Wark describes this area as a flat, dry semi-desert over which a continuous hot wind blows. 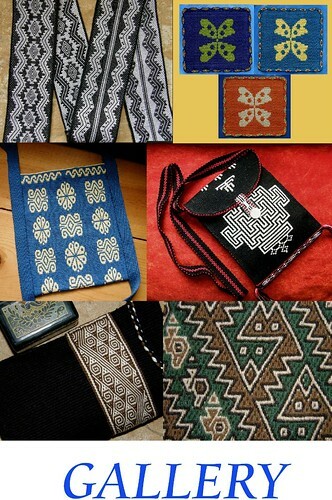 It is always interesting to me to know more about the people, weaving and textiles of lowland regions of this continent. 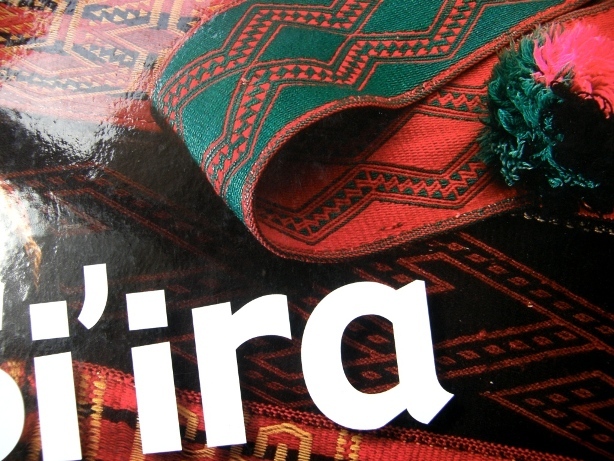 Many different colors are used and I especially love the pictures of the si’ira in the book that comprise a red and black background on which yellow motifs have been woven. Other belts are black with red motifs…very striking…and so they are perfect for the color theme of my wall hanging project. It is also interesting for me to see that the Wayuu weavers use the same style of joined loop heddles used by the Guaraní weavers, another group that inhabits lowland regions, here in Bolivia. 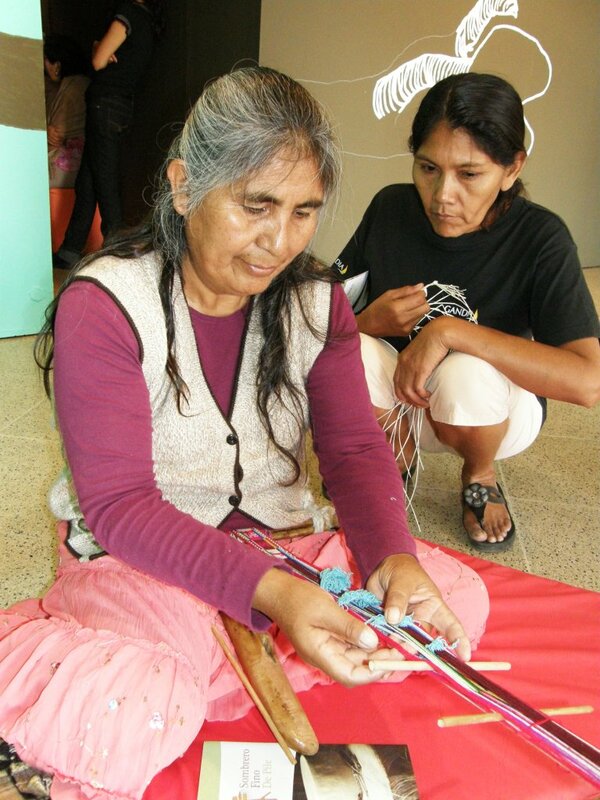 At left you can see my Guaraní teacher, Angela, showing me the unusual way her string heddles are chained together. 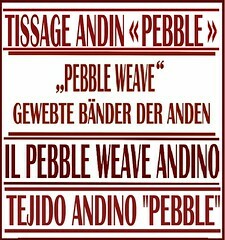 What I would like to see is how the Wayuu weavers manipulate the heddles and if it is the same method that Angela and other Guaraní weavers use. 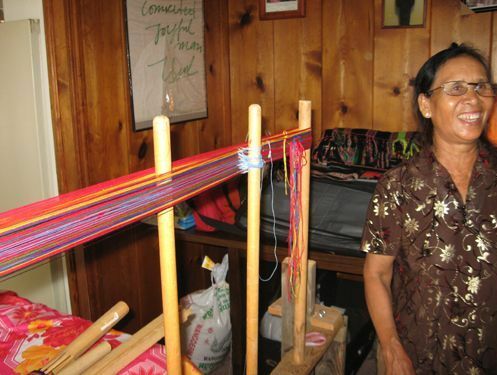 Angela most often has three sets of string heddles on her loom which are required by the technique she employs for the kinds of structures that she weaves. Watching Angela do her pick-up work jumping between two sets of the string heddles is fascinating! The Wayuu weavers use one set of these kinds of string heddles on their warps but I imagine that they would need to work them in a similar fashion to the way Angela does. I can’t help but notice some small similarities in some of the motifs of the Wayuu and Guaraní people although the weaving structure employed is different. So, this will be the basis for wall hanging number three in the red, white and black series. Another of the many interesting things about the si’ira is that they are woven with what Wark calls a “hollow selvedge” which serves to strengthen the edge of the belt. It is funny that on a visit with my friend Pam in Massachusetts we had talked about a rolled selvedge that Harriet Tidball describes in Shuttlecraft Monograph 26. Pam was trying it out on a band of her own. Tidball writes that it was used by the ancient Peruvians and that available evidence shows that it was used on bands and belts. The rolled selvedge creates a thick tubular edge. 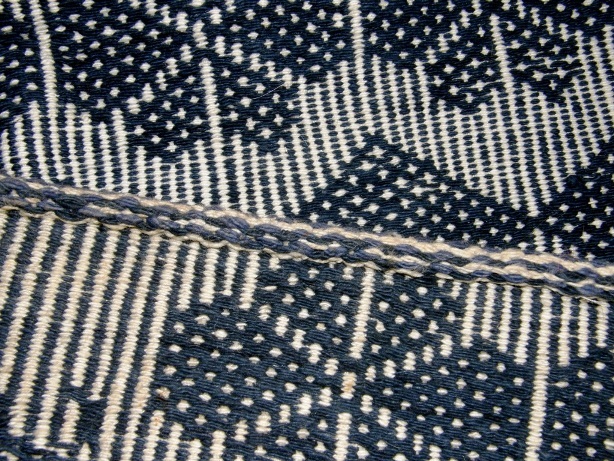 Separate tubular bands like the one on the edge of the purse pictured at left are often applied to Bolivian and Peruvian weavings for various reasons, one of them being to strengthen and reinforce the edges of the textiles. You may be able to make out the thick edge which is the hollow selvedge on this image from the cover of the Si’ira book. How clever to think of a way to form the tubular edging from the band itself so that it forms as weaving progresses and does not need to be added later. I wonder why this technique fell out of use in Peru. I love seeing how these things turn up here and there, disappear here, remain there, evolve further there, are replaced by something even more ingenious somewhere else…The fact that these heddles are used by the Wayuu in their arid lowland home and also by the Guaranì here in steamy jungly lowland Bolivia, so far away, fascinates me. The Worldwide Weaving Web, about which I often speak, means that I can have a new online weaving friend in rural Turkey asking me about backstrap weaving and telling me about the catalog of woven Turkish motifs that his mother has while a weaver and clothing designer in Bangladesh shares with me what he knows about backstrap weaving in his country. Techniques and information are shared instantly across the globe. 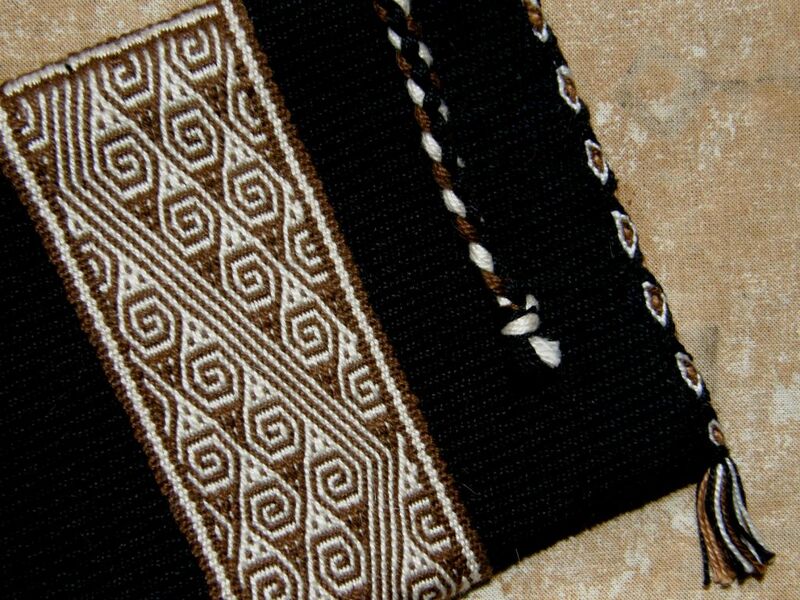 I wonder how in ancient times designs and techniques were transported and shared and adapted among the weavers of this continent. 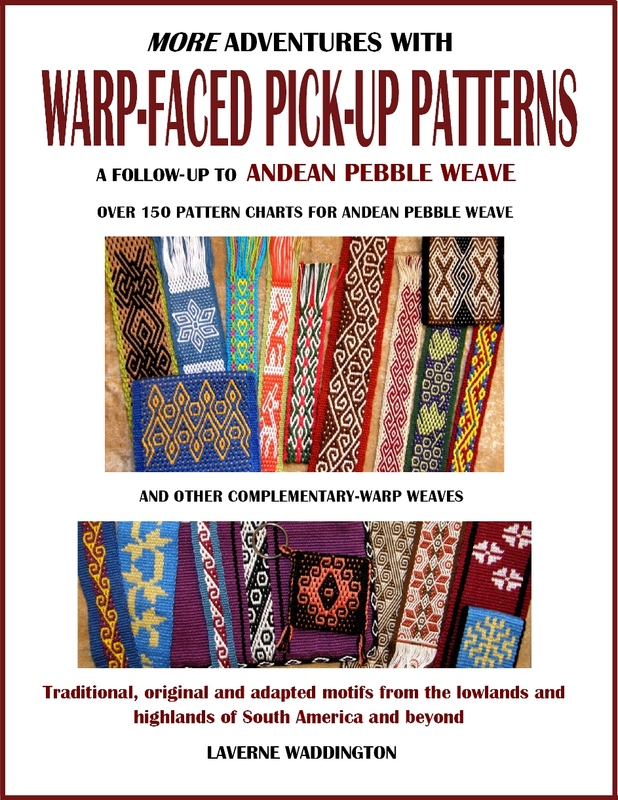 And then you have weavers who live along the relatively short length of Ecuadorian coastline who apply bands to strengthen the edges of their cotton saddle bags. Different techniques are used to both set up the loom to create the patterns and finish the woven pieces in different areas along the coast.. I am familiar with the way the members of one family of weavers in Manabi province finish their work by applying a woven band using a home made rigid heddle which I have shown many times here before. Yet it is worth looking at again..it is so cool! This picture, taken by Kathleen Klumpp, shows my weaving teacher Trinidad weaving and sewing a band to the edge of a small bag. This is how the edging looks on the fabric. 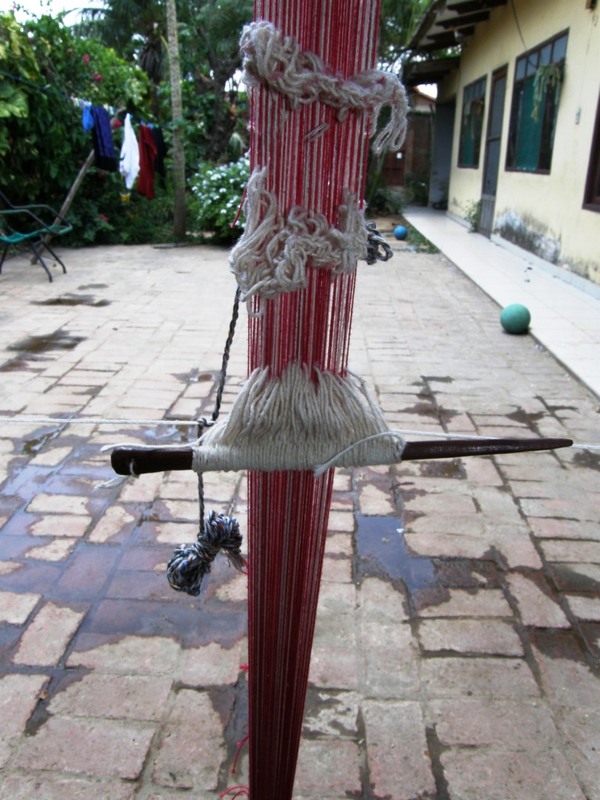 And then I see from an article in the Textile Museum Journal that further north on the Ecuadorian coast, on the Santa Elena peninsula, weavers also apply bands to the edges of their saddle bags but use a very different method which requires an extra pair of hands. While one person sews the band to the fabric, another person manipulates the warp threads passing the warps which are looped on the fingers of their two hands from one hand to the other. 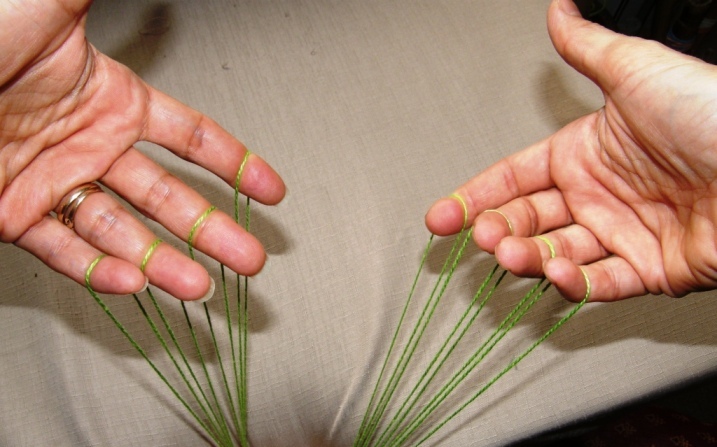 The extra pair of hands would look like mine above (modeled on a drawing in the Journal article). These are two very different ways to add a reinforcement band to the edge of a woven textile and both are being used within a relatively small area. Do similar techniques develop independently or do they travel and get shared and eventually adopted and adapted? Why do some methods remain so different within relatively small areas? I know there are people who devote themselves to studying just this kind of thing. Me? I sit here and ponder! 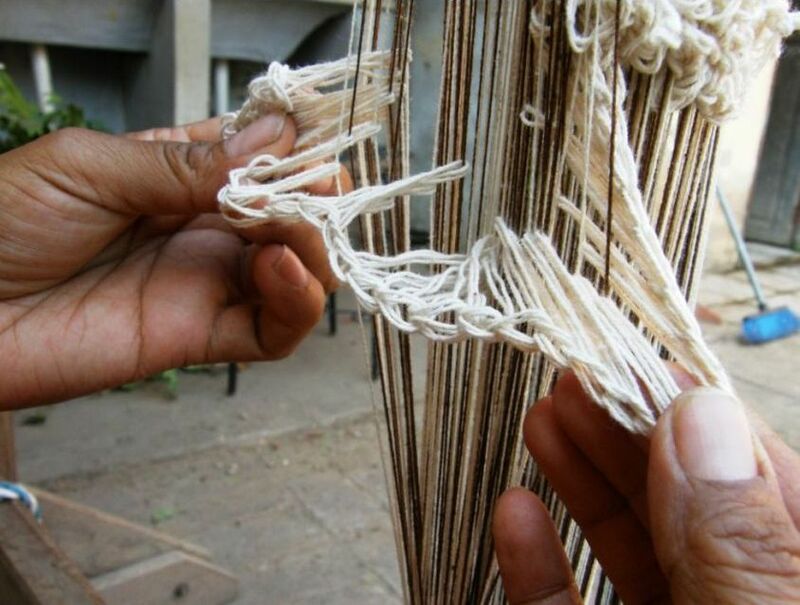 Something that seems common in certain areas of Asia is the addition of string heddles to the warp while the actual warping is in progress on the stakes. Was it developed simultaneously in various areas or did it travel and get adopted? It seems like such an ingenious and time-saving thing to me. However, it is not something I have ever seen in use in my part of the world. I know how to do it as I watched the Montagnard weavers warp when I visited them in North Carolina and, more importantly, filmed the process so I could study it over and over when I got back home….it was all happening so fast! Even though I say it is clever and time-saving, I have not adopted this technique for my own weaving. I stubbornly cling to my favorite way of making heddles with the extra hitch which has the heddle loops held snugly on the heddle rod. In the same way, perhaps the weavers of Manabi province in Ecuador and those on the peninsula further north are aware of each other’s techniques yet stick with their own methods believing them superior…who knows? My anthropologist friend Kathleen Klumpp no doubt can tell us that. Here is the video I made of Ju Nie warping with two colors and making her heddles around one of the two as she goes. That is followed by a video I made in which I do it slowly and explain the process. 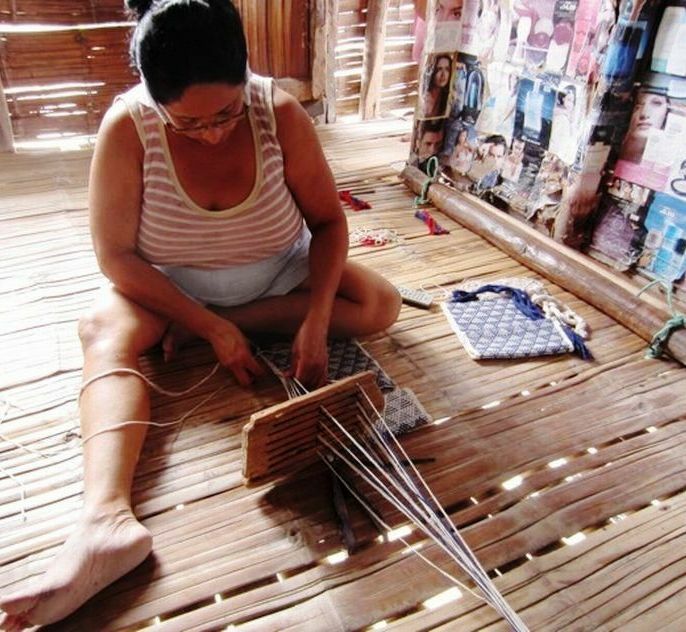 Angela, my Guaraní weaving teacher, certainly didn’t hesitate to ask to be taught how to make the kind of string heddles I use when she saw them on my loom and she started using them on her warp to replace one of her sets of chained string heddles straight away. She had seen string heddles on a stick before, wondered about them, but didn’t have anyone to show her how to make them. 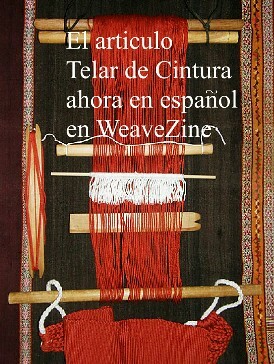 And she was keen to learn how to do the three-color version of the technique she employs when an Aymara weaver visited from highland Chile. And so, techniques and methods travel and get shared and then I guess one day no one will remember anymore how that particular technique managed to cross the Andean high plains and descend to the Bolivian jungle. Well, enough pondering. Let’s see what has been happening in the Ravelry group where some weavers are still having fun with the Bedouin techniques. Here’s Jennifer’s wall hanging which uses the al’ouerjan pattern and shajarah techniques. Many of the motifs in the central section were created and charted by Jennifer herself. Traudi provided us with helpful pictures of her piece before and after washing. She made a placemat and had some tension issues and a bit of puckering, which didn’t all come out in the wash but, what is nice to see, is that the severe ridging that had formed in her cotton cloth disappeared with washing and pressing. 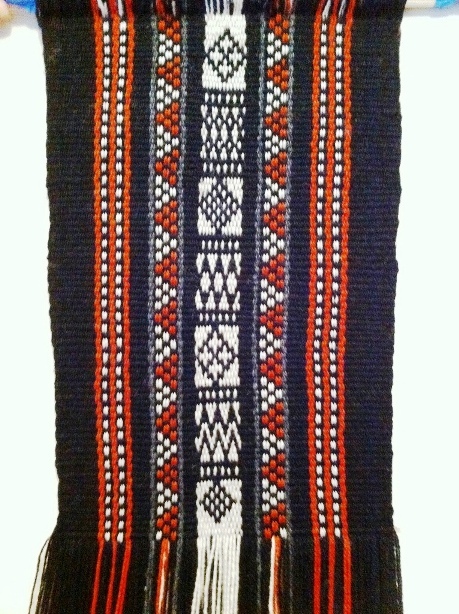 She used weft twining on both ends before leaving the fringe and her center pattern is the traditional Bedouin al’ouerjan design. 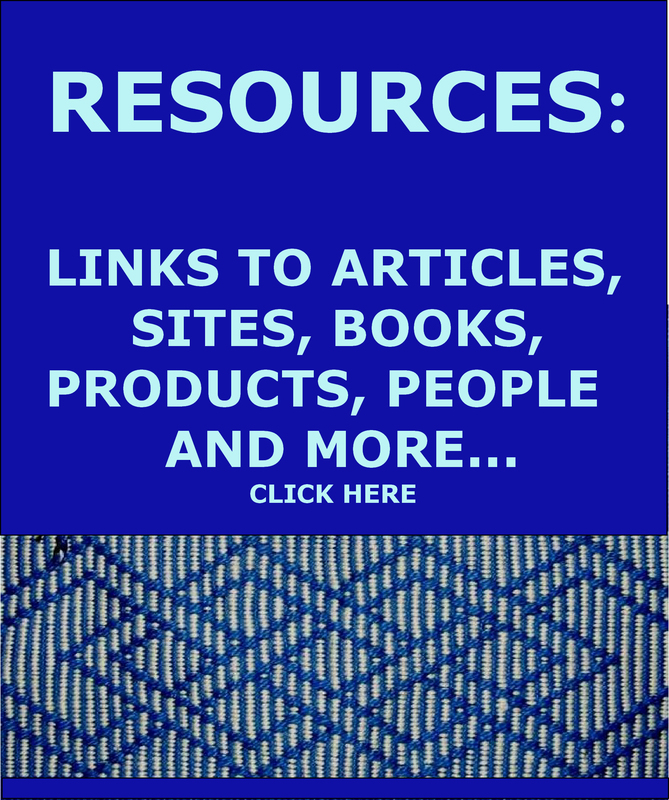 And to finish, I ‘ll just let you know that I put one more tidbit on my RESOURCES page this week. I am slowly but surely gathering up all those links. Thanks Wendy. 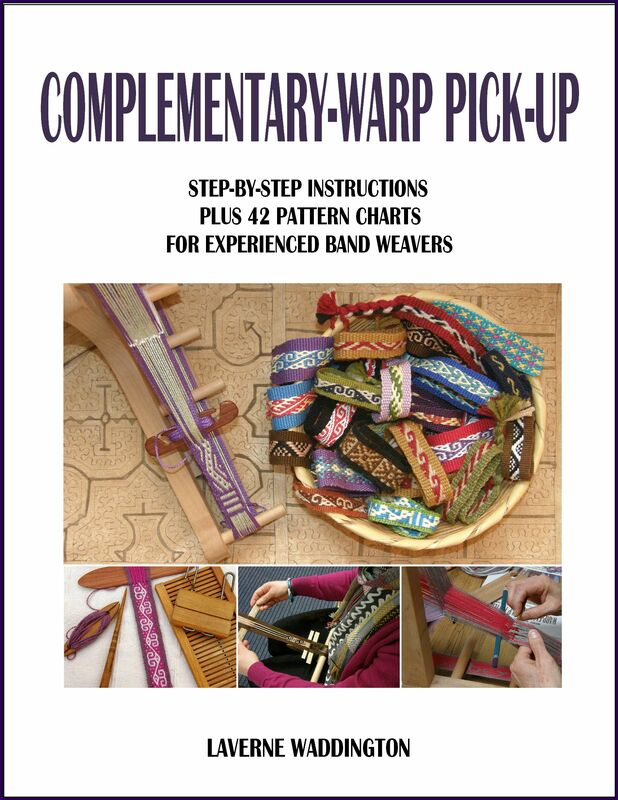 I see that they also use the same kind of split loom bar for their circular warp as the one that I bought from the Burmese weavers and showed last week…so many similarities!